CYP1A1 is located on chromosome 15q24. 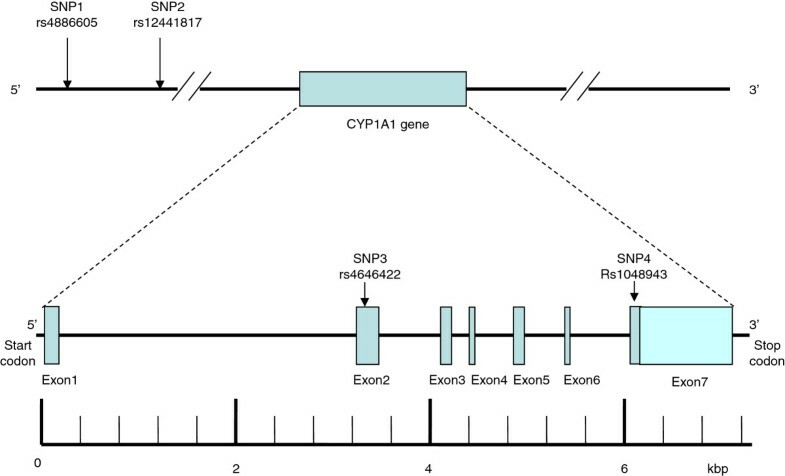 This gene consists of approximately 6.068 kilobase pairs (kbp) and contains seven exons that are separated by six introns (Figure 1). A total of 287 SNPs are listed for the human CYP1A1 gene in the National Center for Biotechnology Information SNP database (http://www.ncbi.nlm.nih.gov/SNP). Using Haploview 4.2 and the HapMap phase II database, we obtained four tag SNPs (rs4886605, rs12441817,rs4646422 and rs1048943) using minor allele frequency (MAF) of >0.1 and linkage disequilibrium patterns with r2 ≥ 0.5 as a cut off. The position of SNP1, SNP2, SNP3 and SNP4 (rs4886605, rs12441817, rs4646422 and rs1048943) occurred in order of decreasing distance from the CYP1A1 gene 3′end (Figure 1). SNP1 (rs4886605) was located 8.037 kbp upstream from the start codon in exon 1; SNP2 (rs12441817) was located 7.863 kbp upstream from the start codon in exon 1; SNP3 (rs4646422) was observed in the exon 2 region of the gene; and SNP4 (rs1048943) was observed in the exon 7 region of the gene. Genotyping was undertaken using the TaqMan® SNP Genotyping Assay (Applied Biosystems). The primers and probes used for the TaqMan® SNP Genotyping Assays (ABI) were chosen based on information on ABI’s website (http://appliedbiosystems.com.cn/). Thermal cycling was conducted using the Applied Biosystems 7900HT Standard Real-Time PCR System. Plates were read using the Sequence Detection Systems (SDS) automation controller software v2.4 (ABI). PCR amplification was performed using 2.5 μL of TaqMan Universa Master Mix, 0.15 μL probes and 1.85 ddH2O in a 6-μL final reaction volume containing 1 μL DNA. Thermal cycling conditions were as follows: 95°C for 5 min; 40 cycles of 95°C for 15 s; and 60°C for 1 min. All 96-well plates were read using Sequence Detection Systems (SDS) automation controller software v2.4 (ABI). An erratum to this article can be found at http://dx.doi.org/10.1186/s12944-015-0121-3. An erratum to this article is available at http://dx.doi.org/10.1186/s12944-015-0121-3.